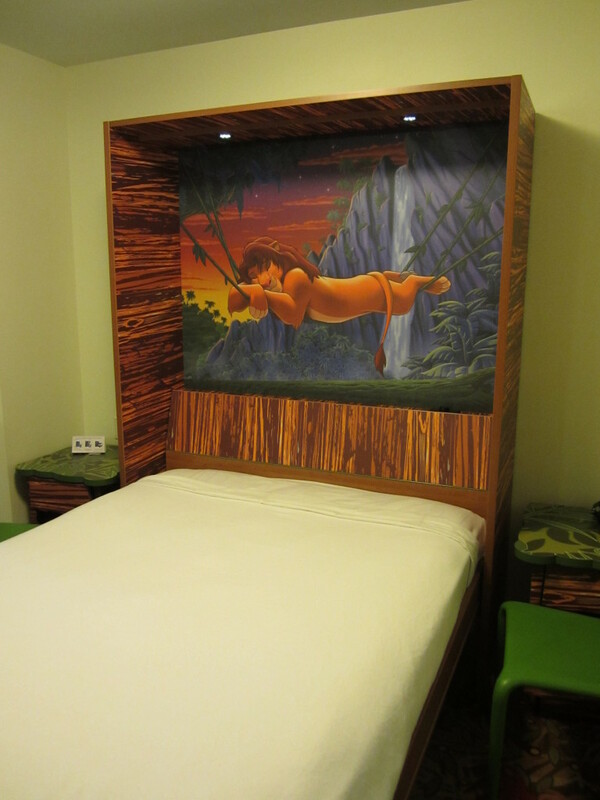 The Art of Animation resort is the newest of Disney’s Value Resorts. 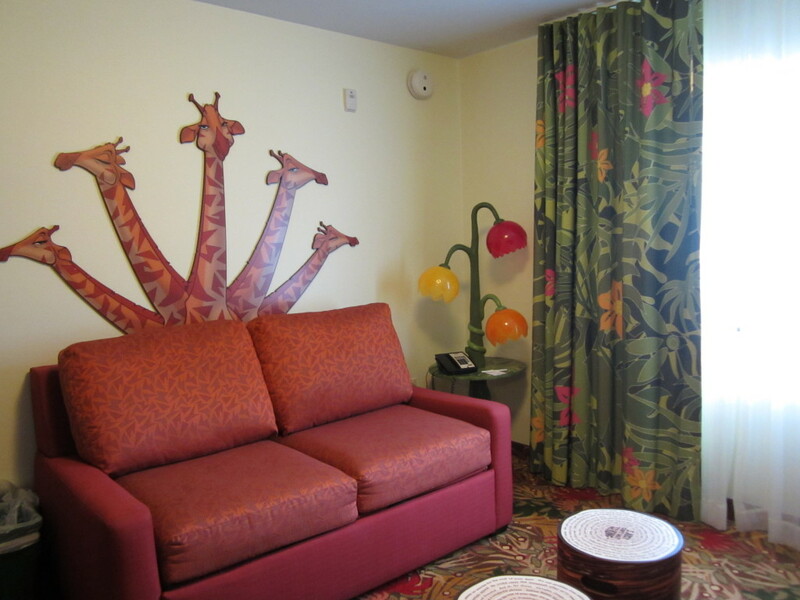 This resort has not only regular rooms, but also 1,120 family suites! It is a larger than life themed resort that makes you feel like you are actually in some of your favorite movies. Cars, Lion King, Finding Nemo and the Little Mermaid are the different sections. When you first walk up to the resort you notice the color and fun. 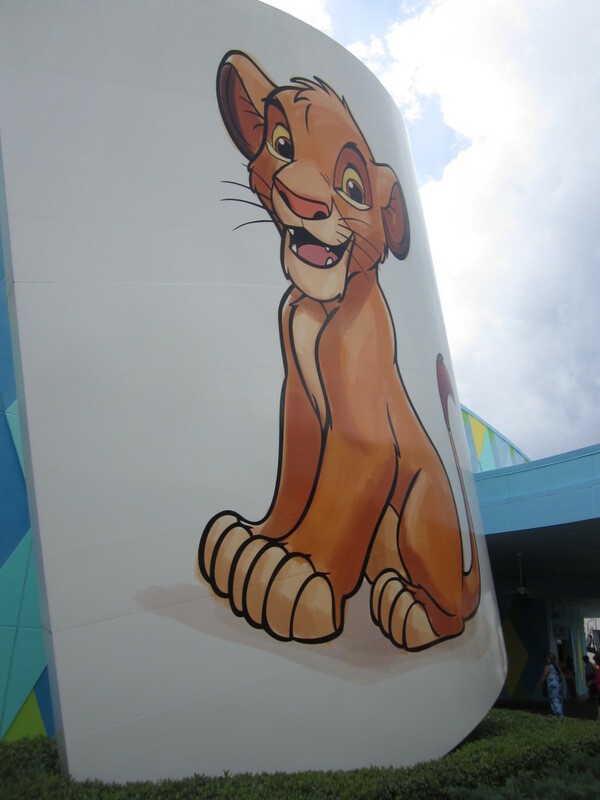 A cheerful Simba greets you as you enter the resort. 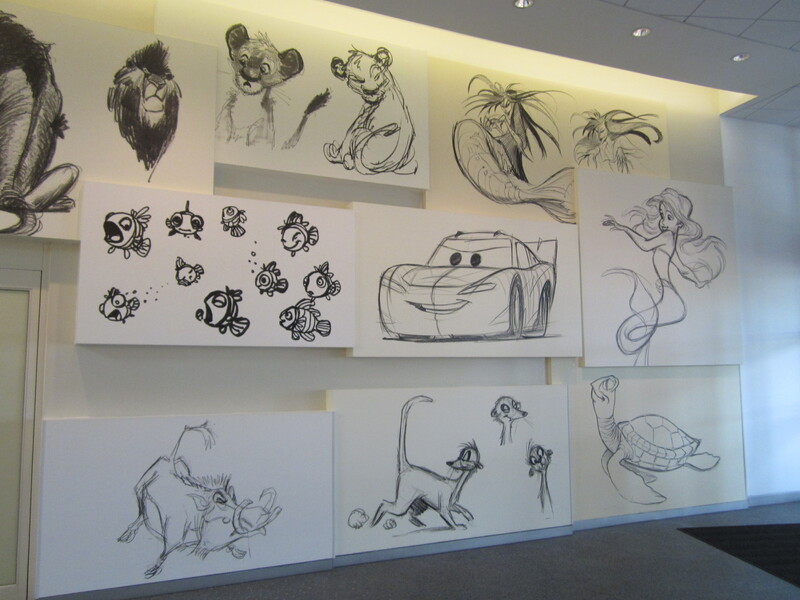 You can see original sketches in the lobby. Artwork from conception to final draft line the entryway. A large light with original artwork in the entryway. 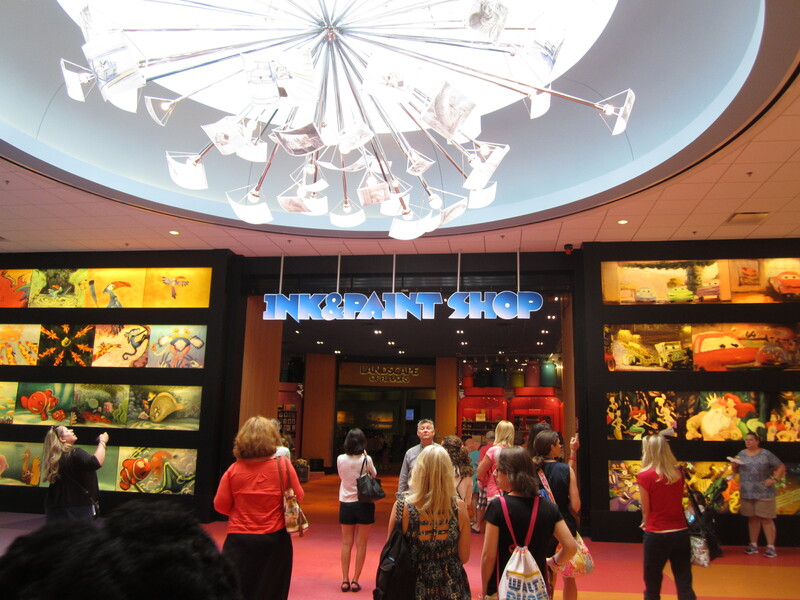 The Art of Animation is divided into 3 areas. The Lion King, Finding Nemo and Cars which all have Family Suites. 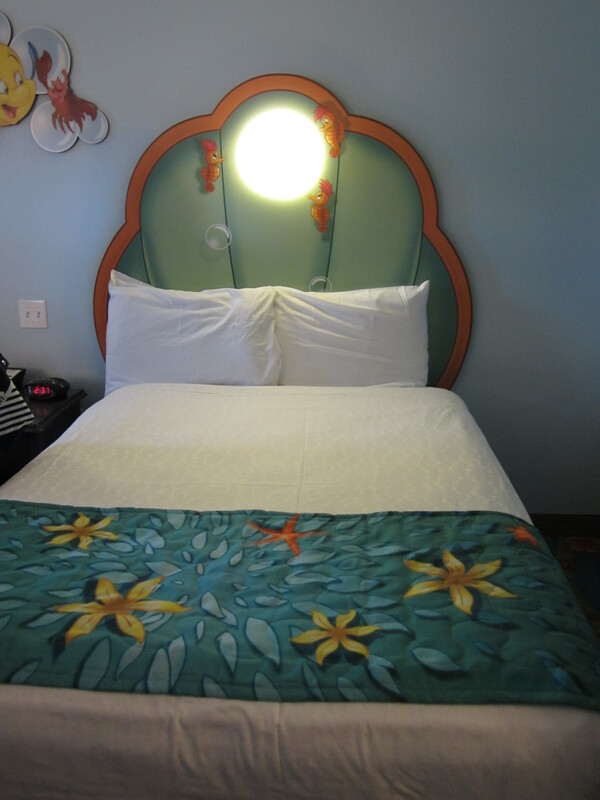 And the Little Mermaid area that has the regular resort rooms. One of the most impressive things about Disney is their storytelling and ability to immerse the guest into the story. Art of Animation is a perfect example. When you are going into the Little Mermaid area the vegetation changes to make you feel as if you were a little fish swimming in the Ocean. 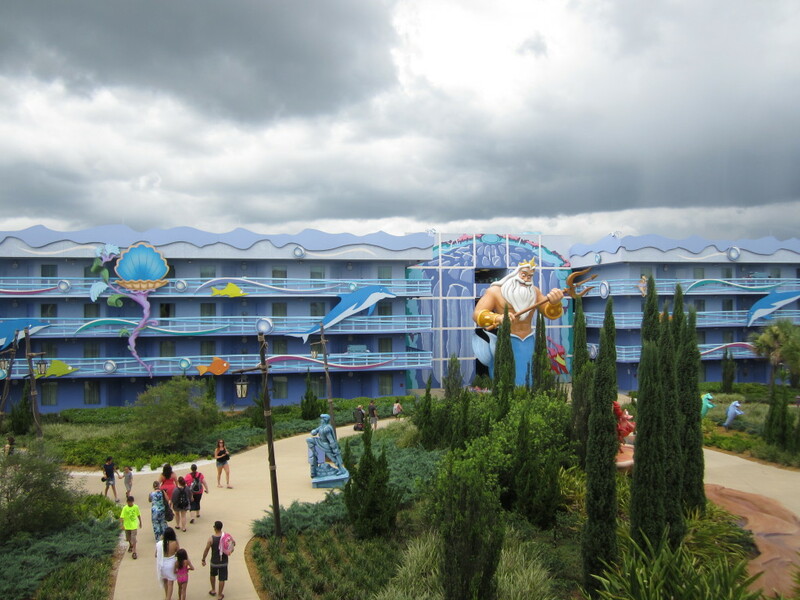 King Triton greets you and the path wanders along with tall bushes as if they were seaweed. 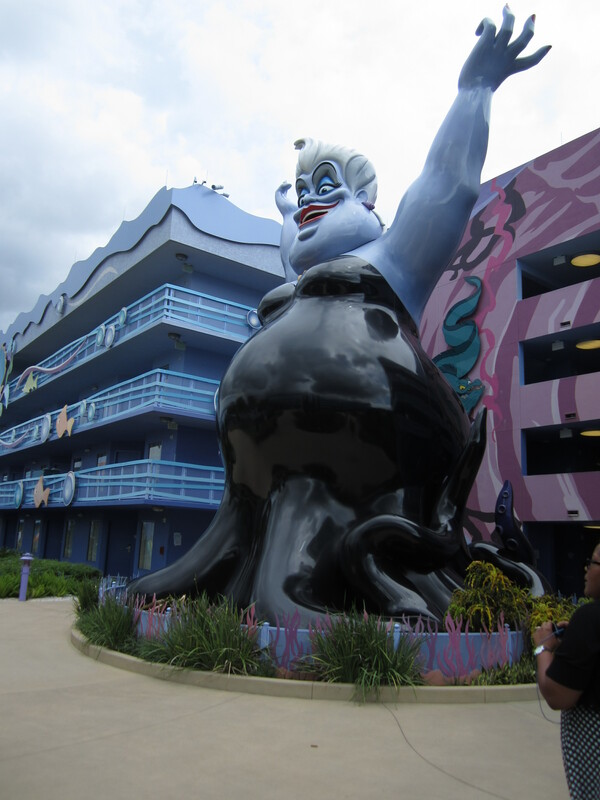 Around the corner you will find Ursula towering over you looking fierce! Further along you will see a pipe that Ariel might have collected. 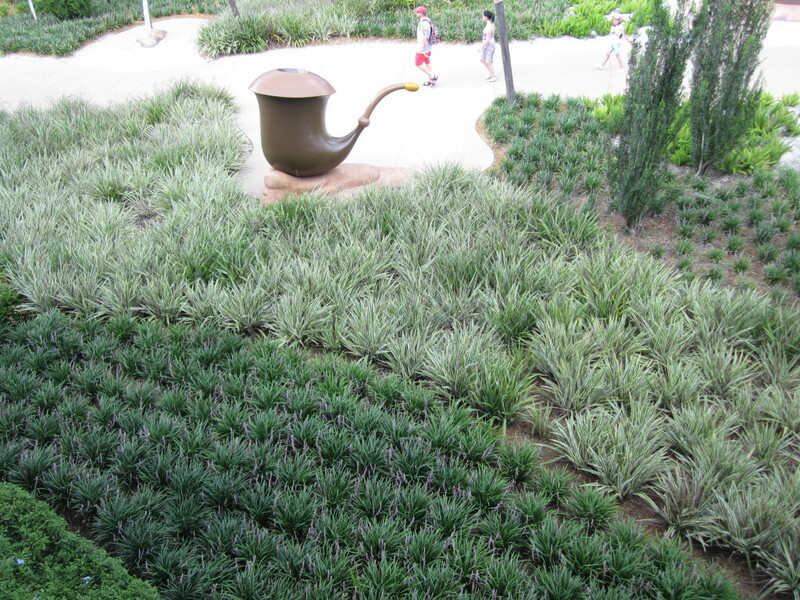 Again the vegetation changes to look like the bottom of the ocean floor! 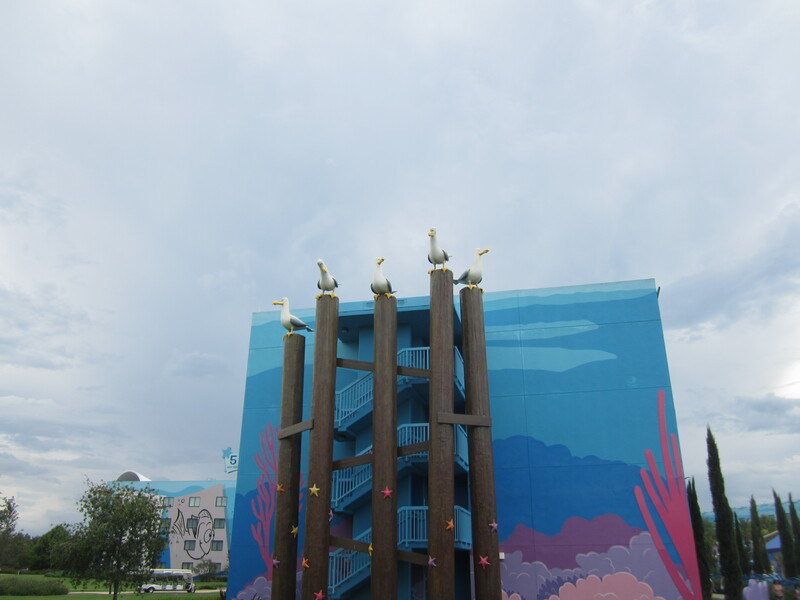 Seagulls from finding Nemo watch you along the pathway. 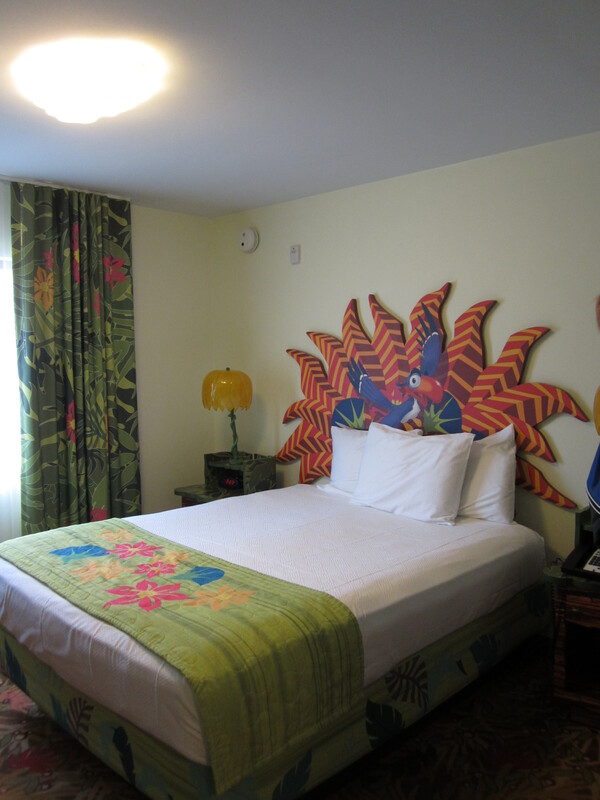 The regular rooms are located in this area of the resort. Some families might be concerned that the Little Mermaid area is going to be too girly. 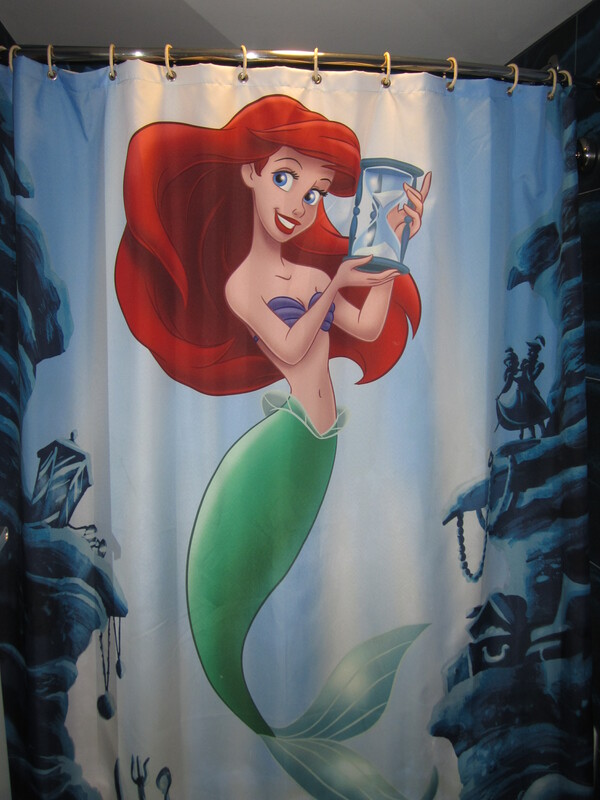 Too much Ariel and that boys wouldn’t like it. Not to worry! There is a clam shell bed with Sebastian the Crab them. 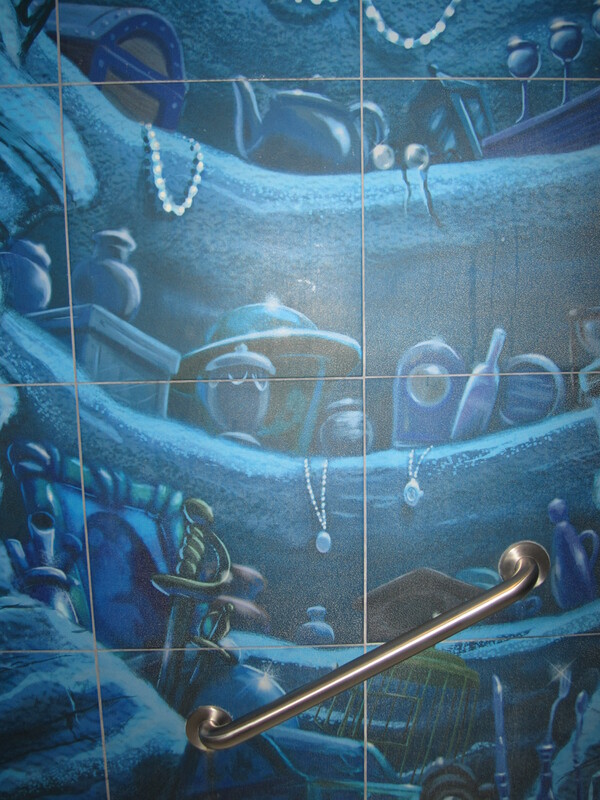 The inside of the shower is filled with sunken treasure. Prince Eric is on the wall happily sailing. 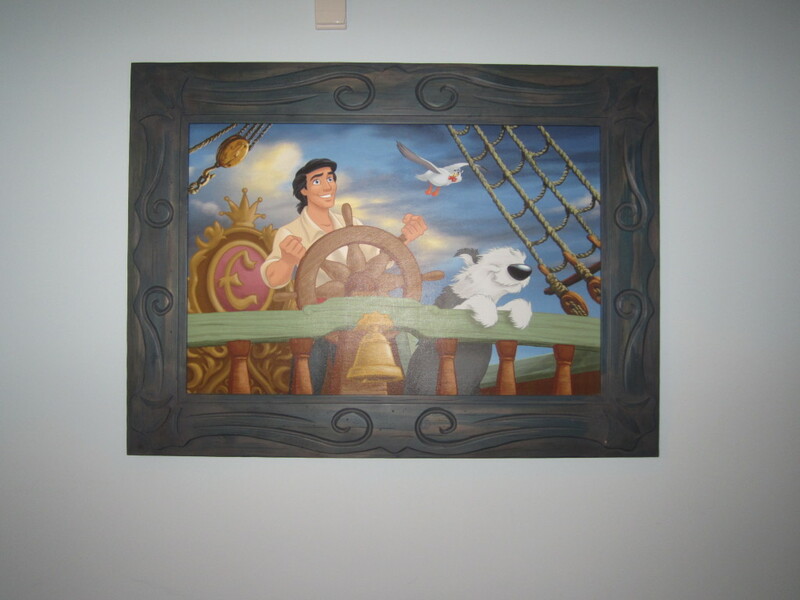 Prince Eric Artwork in the Little Mermaid Room. The next section we viewed was Lion King. 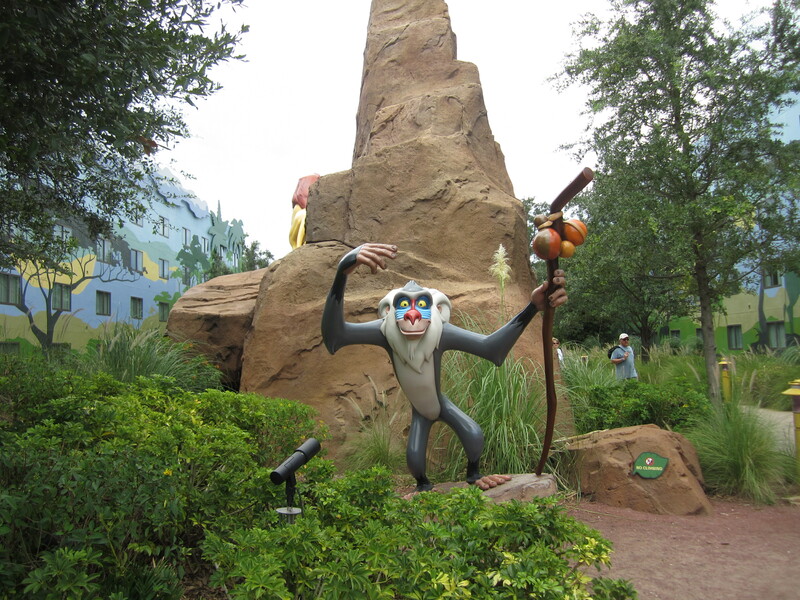 Rafiki welcomes you to this area. Rafiki wants to meet you. 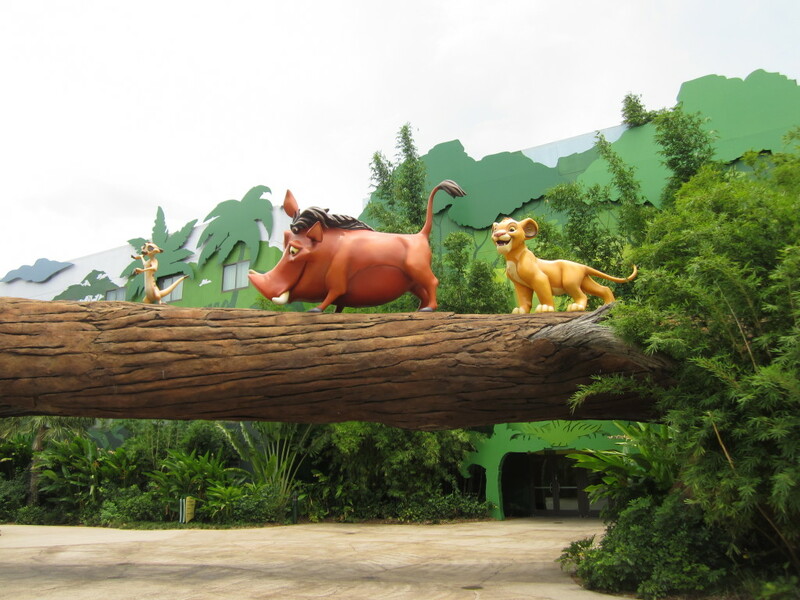 And further along you see Timon, Pumba and Simba walking along. 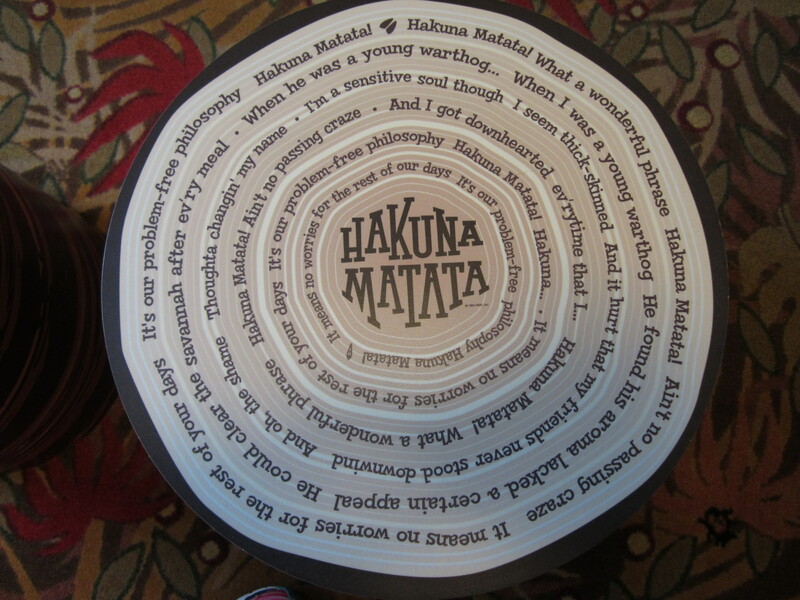 Just living the Hakuna Matata life! One of the most innovative aspects of the Family Suites is the new Inovabeds. 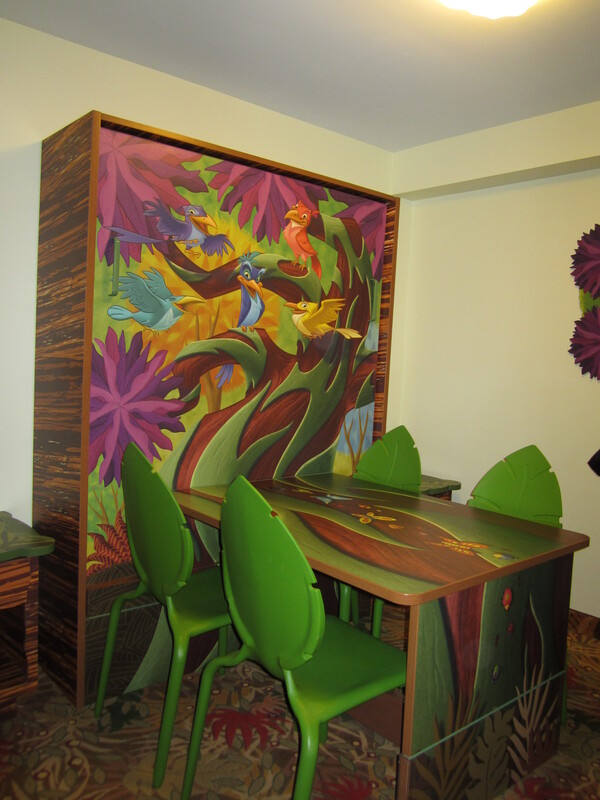 Basically this is a really cool Murphy bed that turns into a table by day! In the photo below, the bed is put away for the day and a table folds down. Making it a great place for the family to have some meals! The main bedroom has a regular bed. And the living room has a couch that also turns into a bed at night. So a family of 6 can comfortably sleep in these family suits. There is a kitchenette and a starter amount of paper plates, bowls and plastic ware is supplied. There is a little sink, a mini fridge and a microwave. Perfect for making breakfast before heading out for the day. 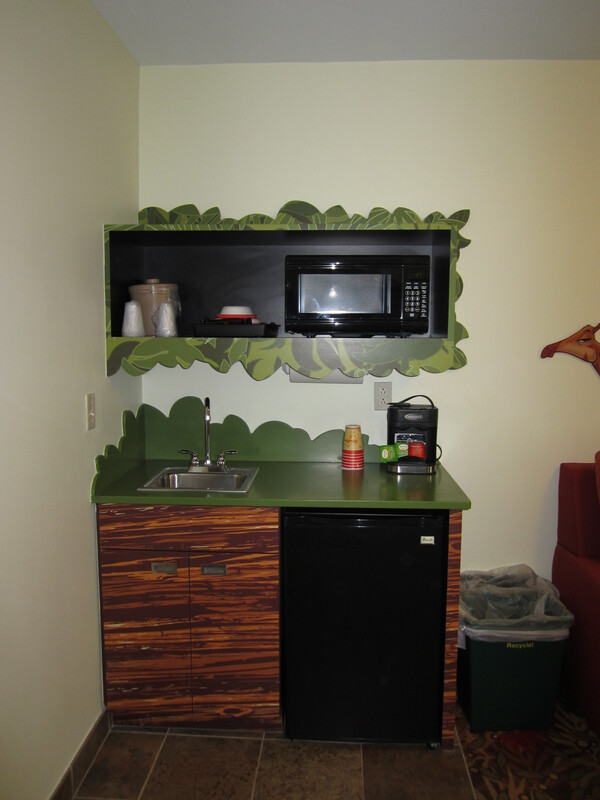 A small kitchenette with mini fridge, microwave, sink and paper goods. There is a closet area for hanging clothes as well as dresser for clothing and a TV. 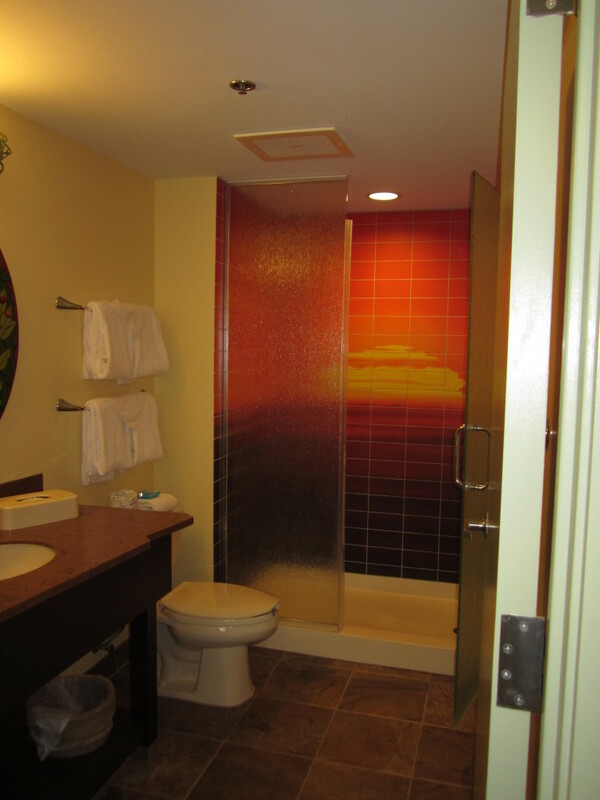 There are 2 full bathrooms in this family suite, one of which has a tub. And the theming continues here! 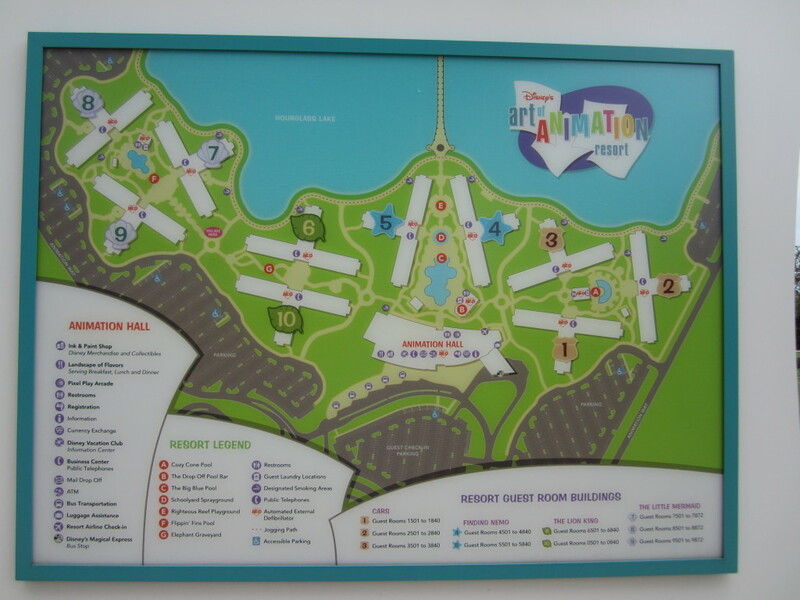 We were not able to see the Cars or Finding Nemo rooms, but they have exactly the same layout. Just different themes. There are 3 heated pools in this resort along with a water feature for the little ones. I even heard that if you listen underwater, you might get to hear something cool!! The main pool at the Art of Animation. 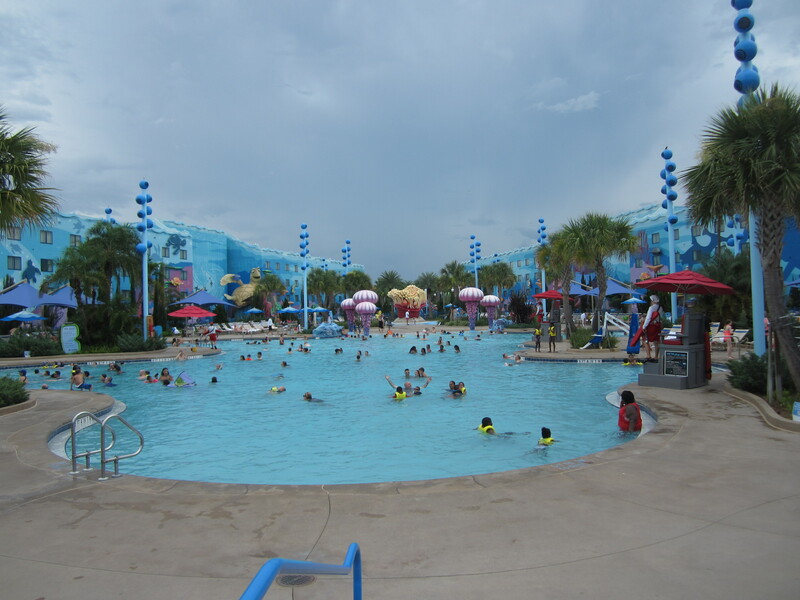 Magic Bands or resort keys are required to gain entry into the resort pools. Assuring that only the on site guests will be able to enjoy the pools. Entry to the main pool requires a magic band or key card. We were also able to eat at the food court here, and I have to say it is one of my favorites! They had a large selection of food. Different ethnic foods along with the standard built your own burger. 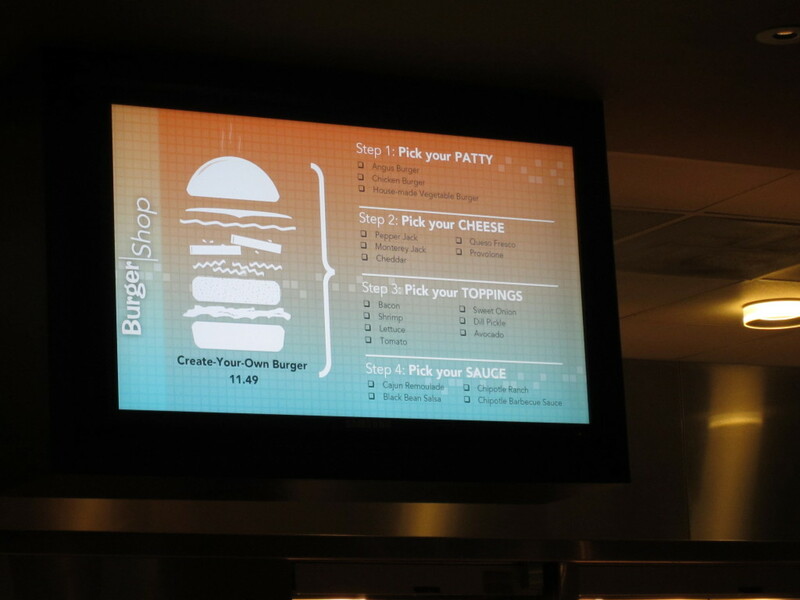 Build your own burger in the food court. 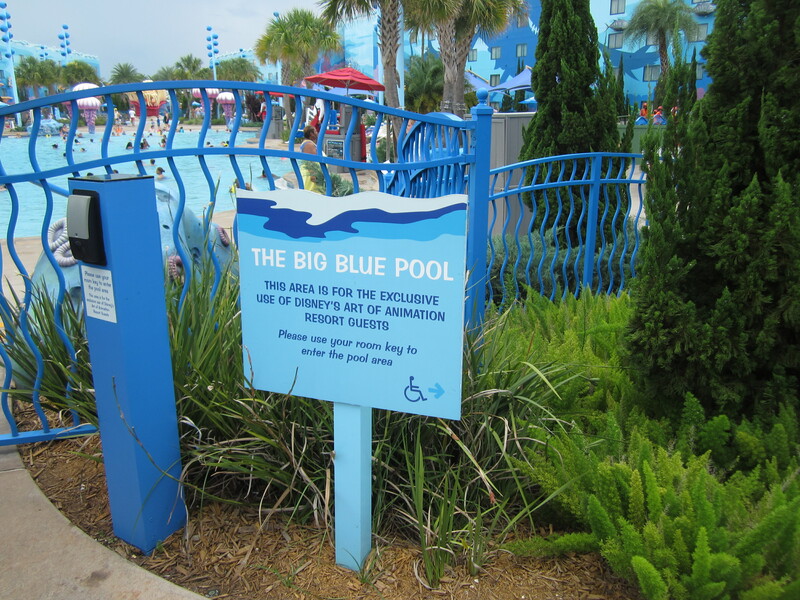 One of the biggest benefits of staying on site at a Disney resort is their attention to detail regarding food sensitivities. As someone who needs to be aware of avoiding gluten I was able to successfully eat everywhere. Disney has just rolled out Allergy Friendly Menus. If you don’t see one handy, just ask any cast member and they will get one for you. I was able to choose a meal based on my needs and have is specially prepared. For gluten they asked me if it was and allergy or a sensitivity. Something really important to know if you are concerned about cross contamination! 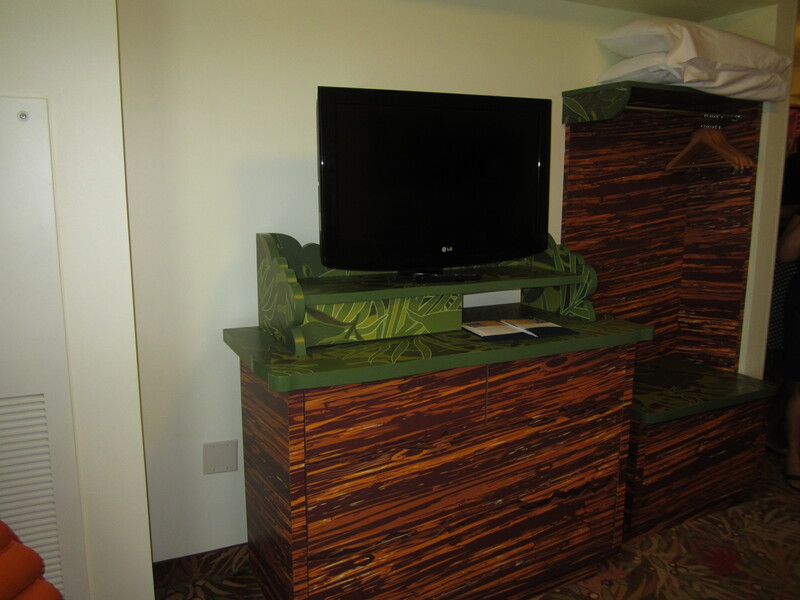 The only downside to this resort is that it often is not included in the promotional discounts as it is very popular. And I wouldn’t let that deter me at all! It is definitely worth it! Until next time! Have a Magical Day! Scar is keeping an eye on me! 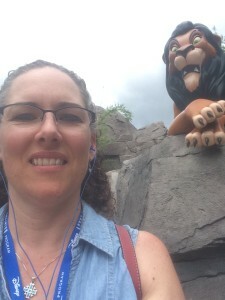 These Disney tips and tricks have worked well for me; your mileage may vary. This entry was posted in Disney, Travel, Uncategorized, Vacation and tagged Ariel, Art of Animation, Born4Travel, BornForTravel.com, disney, family, Family suites, life, Pumba, Rafiki, review, Scar, Simba, Timon, travel, vacation, Walt Disney World. Bookmark the permalink. 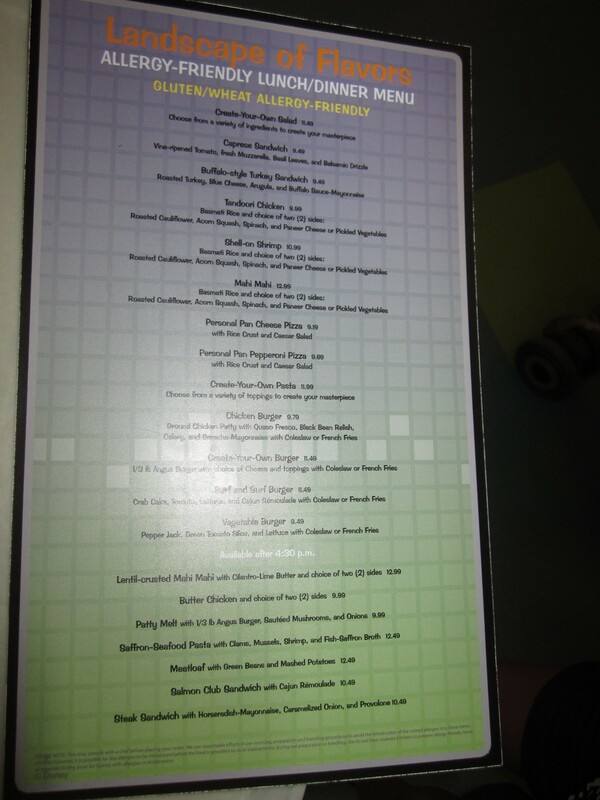 I haven’t stayed there but we have visited for a meal at the foodcourt – so many choices!